Looking for a Richmond events and presentation space to host an awards presentation, sales meeting or other business event? Try the Tin Pan! 1. It’s not the same old boring hotel space. Skip the bland hotel ballroom. The Tin Pan’s warm and contemporary décor will add energy and excitement to your big presentation. Compared to local hotels, the Tin Pan’s more affordable, too. 3. 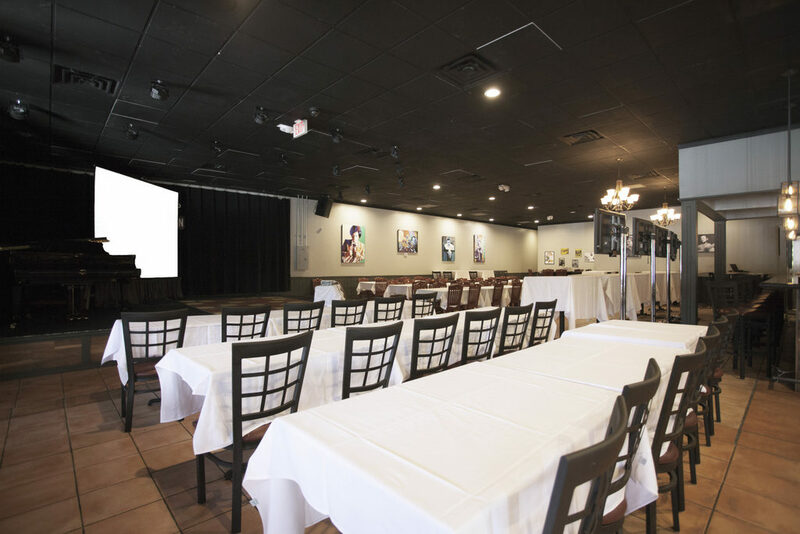 We’re one of the best venues in Richmond for presentation logistics. The Tin Pan is known as the West End’s top venue for seeing live music and other performances, so we’re well equipped to handle your lighting, sound and projection needs. There’s not a bad seat in the house, and we even have a lobby space to greet your attendees and provide any materials you may wish to share. The Tin Pan event space can accommodate audiences from 40 to 220. The Tin Pan is available for bookings seven days a week, both daytime and evenings. We can serve hors d’oeuvres as well as a plated lunch or buffet. Our on-site staff will be happy to help you plan and execute a successful presentation. Contact us to check availability for your presentation or other event.